Theodore (‘Ted’) Dreier was – in many ways – the unsung hero of Black Mountain College. John Andrew Rice receives much of the credit for the College’s founding, though Dreier was at his side following the famous ‘Rollins fracas’ (1) and remained a central member of the College community for the first sixteen years of its existence. Dreier was never the outspoken and confrontational pedagogue that Rice was, nor was he a ground breaking artist like Josef or Anni Albers, the other longest-serving members of the BMC faculty. However, Dreier’s contributions to the College were just as – if not more – crucial to its survival than anyone else’s. Through his dogged commitment, patient accounting, and relentless fundraising, Black Mountain College continued operation through immense difficulty. Dreier gave much of his life to the College, which could never have survived without him. Summer Arts Institute Faculty, Black Mountain College, 1946. 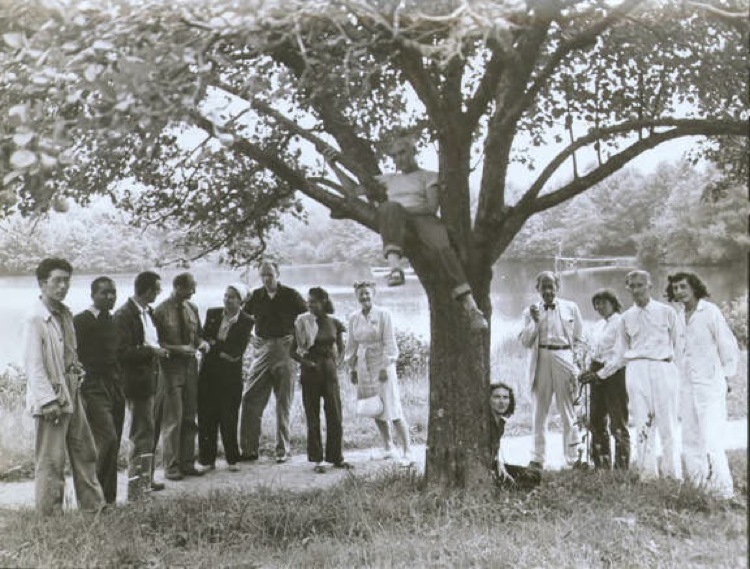 Left to right: Leo Amino, Jacob Lawrence, Leo Lionni, Ted Dreier, Nora Lionni, Beaumont Newhall, Gwendolyn Lawrence, Ise Gropius, Jean Varda (in tree), Nancy Newhall (sitting), Walter Gropius, Mary “Molly” Gregory, Josef Albers, Anni Albers. Courtesy of Western Regional Archives. An engineer with a degree from Harvard, Dreier always wished he could spend more time teaching at Black Mountain. He was listed in various Black Mountain Bulletins as the instructor in mathematics and physics. Later, he spent a great deal of time preparing a course on the ‘Philosophy of Science.’ Yet most of the time, he found himself in charge (first as treasurer, later as rector) of the College’s finances and its physical plant. Many of his wealthy contacts were called upon time and time again to rescue Black Mountain from collapse. Dreier had an unshakable belief in the College’s mission, so eloquently put forward by Rice from the beginning, but he matched that ideological commitment with a practical ability to raise funds and win supporters – the much-needed ‘Friends of the College.’ His family lived at Black Mountain, and his son – Ted Jr. – grew up and studied there. The distressing chapter of Dreier’s Black Mountain story came years after Rice’s departure, when – after the Second World War – the College went through its most difficult and trying period. An American of German descent, Dreier had very close relationships with Josef and Anni Albers, and also – on even more personal terms – with Walter and Ise Gropius, and their daughter Ati, who graduated from Black Mountain College in 1946 and who was the godmother of the Dreiers’ daughter. Founder of the legendary German design school, the Bauhaus, Gropius exercised enormous influence over Black Mountain. Though he never served there permanently, he was a member of the Board of Advisors, taught at the famous summer art institutes, and acted in generous friendship toward Black Mountain and the Dreier family. With the closeness of their relationship, it is no wonder that Dreier included Gropius in the mailing of his resignation from Black Mountain. On August 31, 1948, Dreier wrote to Walter and Ise, ‘This is just a line to say that the die is finally cast. A few days ago I came to the conclusion that I simply could not undertake another reorganization of the college […] I said I wanted to leave.’ (4) In fact, Dreier stayed on just a bit longer in order to help transition to the leadership of Josef Albers as College rector. Yet Dreier had not entirely given up hope for Black Mountain, even as he knew his time there was finished: ‘If the effort is made to continue the College it will have to be made by others who may or may not stand for what Black Mountain has stood for in the past.’ Even in despair, Dreier anticipated a rebirth of the College. This is exactly what would happen, very much in the way Dreier describes. When Charles Olson became the dominant force at Black Mountain in the early 1950s, he looked back to the founding principles laid out by Rice and Dreier, while also looking toward a future that would be, in many ways, quite different. Olson’s Black Mountain – and especially his style of leadership – would probably not have been met with Dreier’s enthusiasm. (We must recognize, Olson’s leadership finally failed; he was not the organizer and fundraiser that Dreier had been.) In the end, it was Olson – not Dreier – who had to spend years liquidating the College’s assets and setting its affairs in order. But, after Dreier’s departure, the College did gain new life. Many people today know of Black Mountain through the Olson phase, which included writers Robert Creeley and Robert Duncan, and the creation of the “Black Mountain Review”. However, Dreier must be given his due. If it were not for his strenuous efforts on behalf of the institution, there would have been no place at Lake Eden for those who followed. (2) Letter from Walter Gropius to Theodore Dreier, April 16, 1944. The Bauhaus Archive, Berlin. (3) Letter from Theodore Dreier to Ise Gropius, August 22, 1947. The Bauhaus Archive, Berlin. (4) Letter from Theodore Dreier to Walter and Ise Gropius, August 31, 1948. The Bauhaus Archive. (5) Dreier, Theodore. ‘Summary Report – Black Mountain College: The First 15 ½ Years.’ Walter Gropius Collection, The Bauhaus Archive, Berlin.